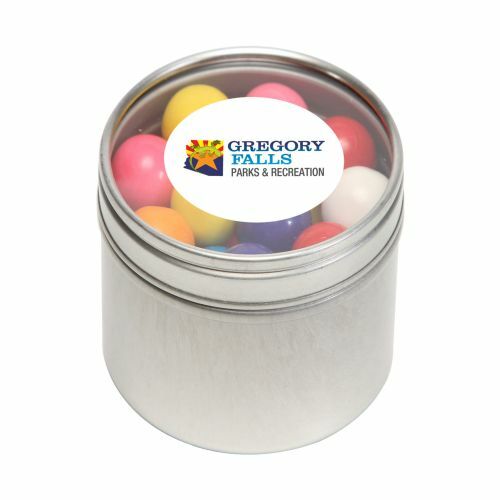 Imprint Method: 1 Color 1 Location - Highlight the candy of your choice and your logo at the same time with an imprinted round window tin filled with colorful gum balls! The tins feature ample space for your company name or logo on the lid and plenty of space to hold your favorite candy. Ideal for continued use once the candy's been enjoyed, fill the 2 1/2 w x 2 1/2 d x 1 1/2 h tin with a variety of other items - paper clips, push pins, or jewelry to name a few. Round out your holiday gift program with one of our promotional window tins! Size: 1.88 " x 2.13 " x 2.13 "